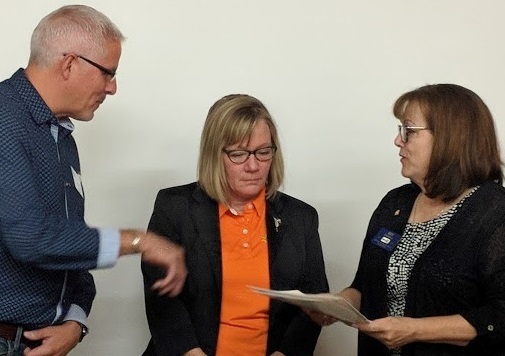 Former President Martin von Holst & Assistant DG Bev Rundell inducted new member Teresa Durning Harker. Teresa started out in the healthcare field, before studying business at Kamloops’ TRU, & working as a licensed property manager. She came to Vernon in 2008 to run our Visitor Centre. When the City of Vernon took over the regional tourism function, Teresa became a private contractor, running our Visitor Services. Past volunteer activities include positions of responsibility for 55 Plus Games, Toastmasters & Vernon Winter Carnival. She’s currently involved with Vernon Golf Spectacular, Special Olympics & Kindale. With her husband Harvey, she shares a blended family of five children & three grandsons. She enjoys hiking, fishing & camping, but we suspect this lady rarely sleeps!